If you’re a budding cook or baker, I highly recommend checking out America’s Test Kitchen, a website dedicated to using science in the kitchen – be it finding out how baking soda works, or test-running several mixers to see which works best, or the best combination of ingredients to create the perfect recipe. This Thai-inspired chicken that I made was a recipe that I pulled from their website. 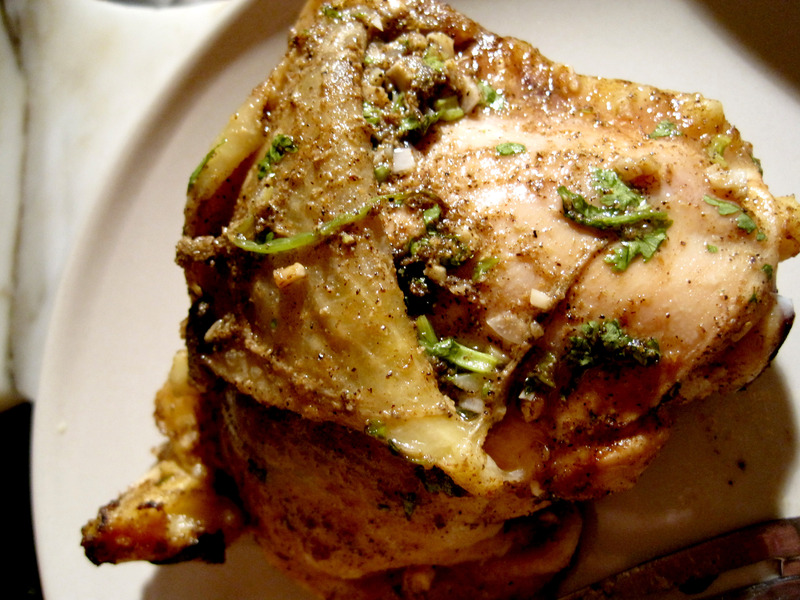 This chicken is arguably the best savory recipe I ever made. (My honey-soy glazed salmon has been overthrown.) It was not a very technically complex dish, but it did require a bunch of different ingredients that I didn’t have, such as cilantro and coriander. I am so glad I didn’t decide to forgo or substitute it, because those herbs really made the dish. The devil is really in the details in this recipe, like stuffing the skin with some of the spice rub, and the sweet, tangy and spicy sauce that you used to dip the chicken. Oh, that sauce. I would use it as a dipping sauce for everything. I was also really surprised at how flavorful the chicken got even though I didn’t marinate it, but the fresh cilantro and generous amounts of coriander really gave it a strong kick. I didn’t have a grill, so I baked instead of grilled my chicken at 500F and then let it sit in the hot but switched-off oven for a while. My chicken turned out slightly undercooked, but I suspect it’s a combination of a) not letting my oven get really, really hot (I was kinda scared of testing the limits with the tiny oven I have) and b) using bone-in thighs versus boneless breasts, like the recipe recommends. Nevertheless, this is definitely a come-back recipe. 2. For the dipping sauce: Whisk ingredients in small bowl until sugar dissolves. Let stand 1 hour at room temperature to allow flavors to meld. 3. To make and apply the rub: Combine all rub ingredients in small bowl; work mixture with fingers to thoroughly combine. Slide fingers between skin and meat to loosen skin, taking care not to detach skin. Rub about 2 tablespoons mixture under skin. Thoroughly rub even layer of mixture onto all exterior surfaces, including bottom and sides. Repeat with remaining chicken pieces. 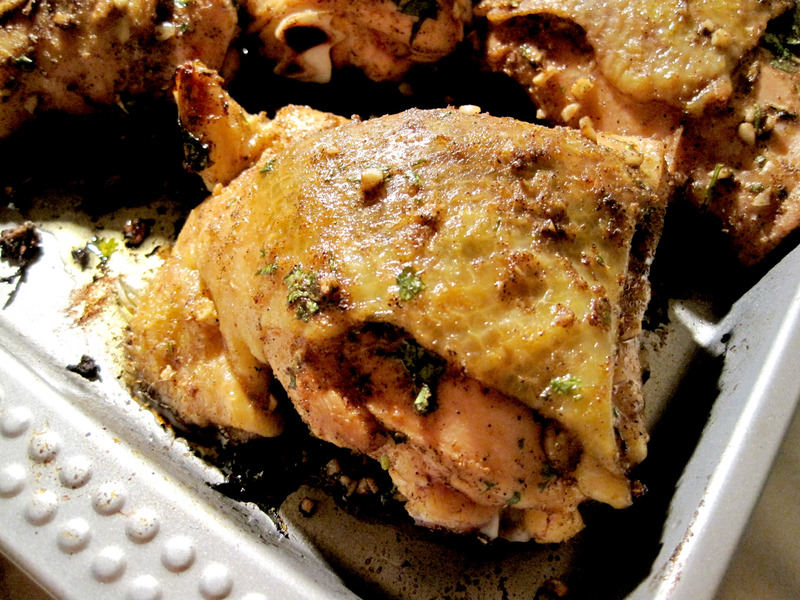 Place chicken in medium bowl, cover with plastic wrap, and refrigerate while preparing grill. 4. To grill the chicken: Turn all burners on gas grill to high, close lid, and heat until grill is very hot, about 15 minutes. Scrape grill grate clean with grill brush; using long-handled grill tongs, lightly dip wad of paper towels in vegetable oil and wipe grill grate. Turn all but 1 burner to low. 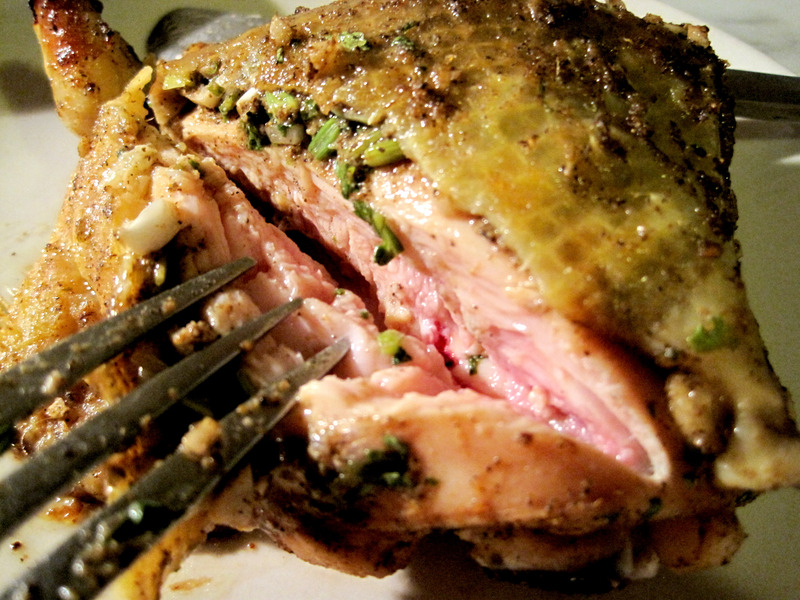 Place chicken, skin-side down, on hotter side of grill; cook until browned, 4 to 5 minutes. Using tongs, flip chicken breasts and cook until browned on second side, 4 to 5 minutes longer. Move chicken skin-side up to cool side of grill and close lid; cook until instant-read thermometer inserted into thickest part of breast (not touching bone) registers 160 degrees, 12 to 15 minutes. Transfer chicken to serving platter; let rest 10 minutes. Serve, passing sauce separately.